U10s: Rugby Town Girls v Asfordby Amateurs: The U10s made their second longest away trip of the season to Asfordby Amateurs to play on a partially frozen but thawing pitch. Due to illness and player unavailability, only the bare minimum of six players made an appearance. It was always going to be hard work playing a full match for each player, but they all rotated positions to give each other a breather, showing great team work and comradeship. The hard work that every player put in was fantastic to witness and made all the supporters that made the trip extremely proud. An outstanding debut from captain for the day, Charlotte Dickens, resulted in the Player of the Match award. Players on the day Amy Raine, Charlotte Dickens, Mims Deitch, Ella Hepworth, Ellie Lynn, Ellie-Mae Partridge. U13s: Harborough Town 4 Rugby Town Girls 1: With several players either ill or injured and no subs, Rugby Town knew this was not going to be an easy game. Harborough were on the attack from the start with defenders Lucy Garrard, Elizabeth Ashmore and Kerri Wood having a constant battle to keep them at bay. Goalkeeper Megan Evans stopped many shots from getting into the net, but Harborough’s persistence finally paid off with the only goal of the first half. Rugby Town came out revitalised after half time with midfielders Megan Stewart, Catrin Burns, Chloe Raine and Charlie McCulloch getting the ball up to Phoebe Stewart to enable Phoebe to equalise. 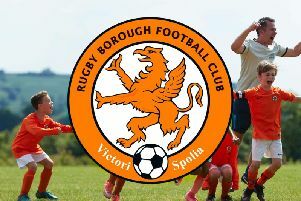 Despite some great play from Liz, Kerri, Megan S and Phoebe and some excellent saves from Megan E, Rugby were unable to hold Harborough back and the final score was 4-1 to Harborough Town.